Visualization and relaxation just might be the easiest way to develop the mindset of a marathon or half marathon runner. When you bring your mind and body into a totally relaxed state, you can then visualize and create an image of yourself completing the perfect training run or you effortlessly crossing the finish line on race day. As you form this image, your subconscious mind goes to work for you to bring that image into reality. Once you learn how to focus on and relax specific parts of your body, you can also use this technique on training runs to ease pain or tenseness that you may experience during the run. 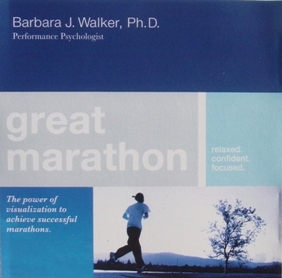 Barbara J. Walker, Ph.D., a Performance Psychologist and marathon runner herself, has created an excellent visualization CD, Great Marathon, for marathon and half marathon runners. On the CD, Dr. Walker discusses the mental aspects of running a marathon and provides a powerful guided imagery exercise which allows you to experience a successful marathon or half marathon in your mind’s eye prior to your actual race.